Not many people would get excited about parking lot pictures. But when it’s the Disneyland parking lot – then you have fans’ attention, right?! Today’s Throwback Thursday feature isn’t a deep dive into history or a wordy recollection of the way it was. However, what is cool about the few images we want to share with you, is that they capture a really interesting moment in Disneyland’s history – as it began its transformation from a theme park to a resort destination. 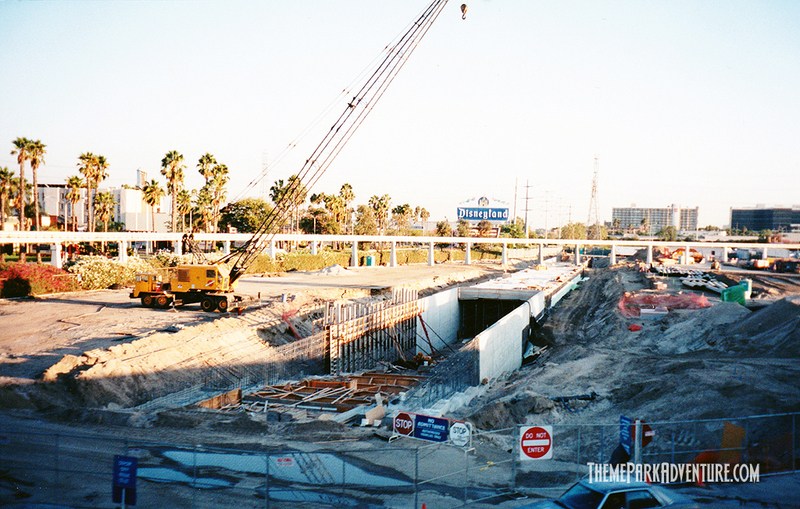 There are no dates scribbled on the backs of these photos, so I will guess that they are circa 1997 – 1999, as Disney California Adventure’s construction had just started (at least, in one of the shots, it has). 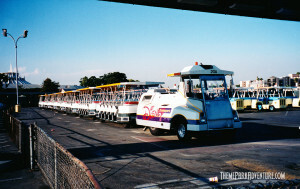 This first photo shows two generations of Disneyland parking lot tram sitting side by side in the parking lot. In fact, I do believe this was the first of the Walt Disney World-style trams that eventually replaced Disneyland’s iconic blue and gold trams, which you can see in the background. Just a neat snippet in time, as the new trams come on the scene and the old ones begin their fade into the history books. Next up, we have a picture taken in the late afternoon from the parking lot across from what is now the Paradise Pier Hotel. The power lines and towers that once crossed the Disneyland parking lot can be seen here in all their electrifying glory. That green building in the center left of the image is the Indiana Jones show building, indicated by its color (show buildings at Disneyland are painted in green to assist Cast Members and fire/law personnel). It’s pretty hard to imagine seeing Indy sitting out there encroaching on the parking lot like that without Downtown Disney, or Disney’s Grand Californian blocking the sight line, isn’t it? In the far center right of the image, we can see the 10-story Grand Hotel, which Disney purchased and then had imploded on the morning of Sunday, March 22, 1998. This was part of Disney’s master plan in the early stages of transforming the theme park into a resort in the middle of Anaheim. Finally, here’s a shot of early California Adventure construction. One of the first things that was built was a massive tunnel for vehicle access under and into DCA for trash, food deliveries, construction needs, etc. In the background, you can see the old Disneyland sign; not the first Disneyland sign mind you – but definitely the one that many TPAers grew up with and remember fondly; it stood on Harbor Blvd. from 1989 – 1999, before it was removed. This section of the Disneyland parking lot was Bambi, where Cast Members from back in the day will recall parking and walking through Harbor House and down the ravine, to the backstage area of the park behind Tomorrowland each day to begin their shifts; I was one of those folks, and I am lucky enough to remember these things like they were yesterday, as opposed to some 27 years ago. Man, where does the time go? And that’s it! 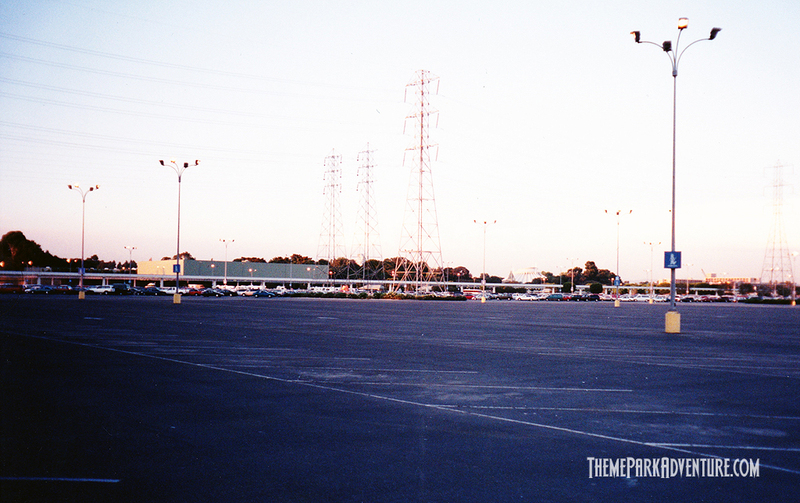 We hope you have enjoyed our Throwback Thursday look at the old Disneyland parking lot! If you have your own memories of the old trams, early DCA construction or even the Disneyland sign on Harbor, please share them below in the Comments section – the more we reminisce, the more history we preserve here on TPA for younger generations of fans! This entry was posted in Features, Home Page, Home Page Slider and tagged Disneyland Resort, The Walt Disney Company, Throwback Thursday. Bookmark the permalink. I was there when construction began on California Adventure, and you could peek through and over fences and see big piles of dirt. There was also a gallery showing the plans for attractions and things. It all looked really exciting then, but who knew that after it opened it would just look like a cheap amusement park with so little quality Disney Attractions to do. Now California Adventure is better than parts of Disney World, but one of the most striking disappointments (comparing things to Disney World) is the tiny representation of Cannery Row in Monterey. Anything at World Showcase is done hugely better. And at Disney World, the Tower of Terror is about a thousand times better ride with truly terrifying drops. In California you drop a bit, and girls scream, and guys say “woohoo!” In Florida EVERYONE screams!! And I mean they SCREAM. I could go on and on, but I do enjoy California Adventure for Toy Story (which desperately needs an additional show building), California Screamin, and even Monsters Inc. with it’s cheaply built non-animatronic cast. Oh yes, one other strange difference I want to report: In the Hollywood Studios in Florida, The Muppet Show is in a building that you can actually find with a big attractive courtyard. I mean, it is literally very attractive, in that it attracts well over 10 times as many people into the theatre. I have been to The Muppet Show many, many times in California, and seen about 10 to 30 people there no matter how crowded the Parks are, but in Florida, during a quiet weekday in January, that Theatre was almost full to capacity, seriously, those kinds of differences are extremely telling in my mind, and shows yet another thing that is STILL wrong with California Adventure.